5 entries categorized "Tips and techniques"
I've created several artworks that incorporate fiber sculptures. The sculptures look exactly like they are made of metal, but when you touch them, you discover that they don't feel cold. Right now, I'm making a tactile sample for an exhibit at the Columbus Museum of Art (OH), where I will have two works on exhibit this summer, Knitted and Transformed. Using the sample I am making, I will show you how I made the "metal rollers" for Transformed. I frequently use foam pool noodles as filler, because they are both lightweight, which reduces shipping costs, and chemically inert, so they will not deteriorate and "gas out" as they age. I have also used other materials, like aluminum foil, to create my basic shape. 1. If using a pool noodle, I cut it to the proper length using a serrated bread knife. It cuts like buttah. 2. Wrap the noodle or basic shape smoothly in about 3 layers of blue painters tape. You'll get the best results using the type shown in the picture. The more layers of tape you apply, the stiffer the outer shell of the sculpture will be. 3. 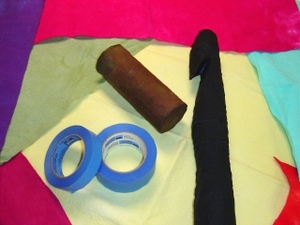 Glue a layer of black fabric all over the blue tape using watered down Elmer's Glue. Trim the fabric as needed to fit the form. You don't need to make it completely smooth, depending on the final effect you want. Make sure everything is saturated, so paint the glue both under and over the fabric. Check during the drying to be sure the sculpture isn't sticking to the table. Let dry completely. The black "crochet hook" on the right is at this stage. 4. I use hand dyed cotton batting as the outermost cover. 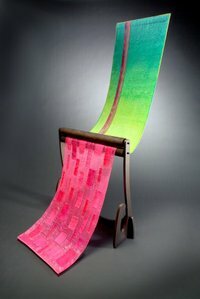 In the picture, you can see some examples of my hand dyed batting in the background. The best batting to use is Warm & White and you don't even need to prewash before dyeing. I like to use a very dark brown or black color for simulating the look of metal. Glue the batting onto the form, trimming to fit. Use watered down glue, saturating the batting fairly thoroughly. After a minute or two, the batting will soften to the point where you can smooth the cut edges with your fingernail and move it around to some extent. Check during the drying process to make sure all areas are covered. Dry completely. The small brown tube in the same picture is at this stage. 5. 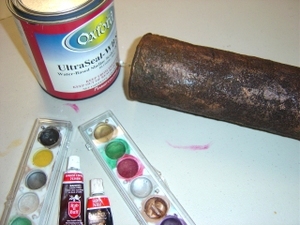 Rub several colors of metallic rub-on craft waxes in splotches on the batting. 6. Paint the sculpture with several coats of a water-based shellac. I like to use a "blonde" color. The first coat will be soaked up quickly by the batting, so let it dry thoroughly before the next coat. When you are done, the sculpture will resemble aged metal, but be much lighter in weight. The finished sample can be seen in the last picture. Now wasn't that fun? Just don't try to display this as outdoor sculpture.